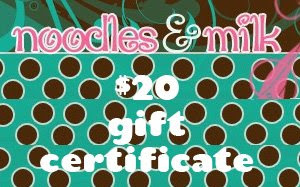 The winner will get a $20 (US dollars) gift certificate and free shipping in the US. 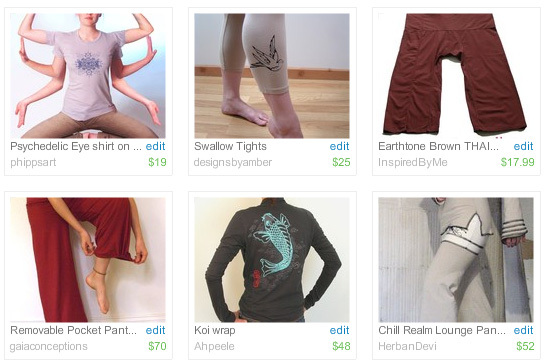 Visit noodlesandmilk's shop and pick a favourite item. This giveaway ends 4th January at midnight EST. Good luck! The new online zine VivaLaModa seems to be getting popular! People love it and I would like to spread the word, so if you want to link to it or write about it that would be great. Let me know and I can send you images or badges if you need them. Merry Christmas! 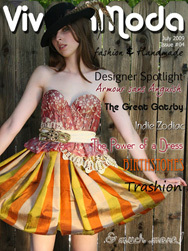 - New Online Fashion Magazine! First of all, Merry Christmas (or Happy Holidays)!!! And after weeks of working on this project, my gift for you guys this Christmas Eve is a new online fashion magazine! 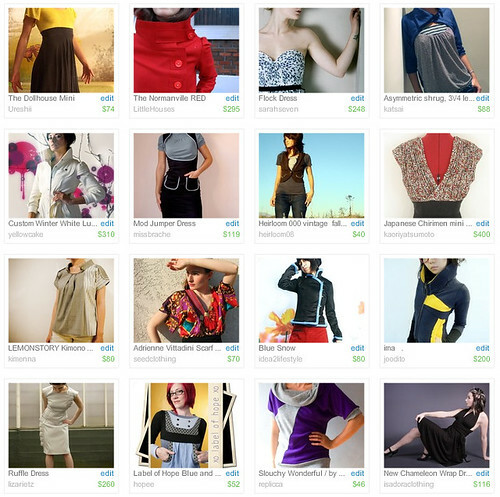 All focused in handmade / vintage / indie clothes, designers, etc. 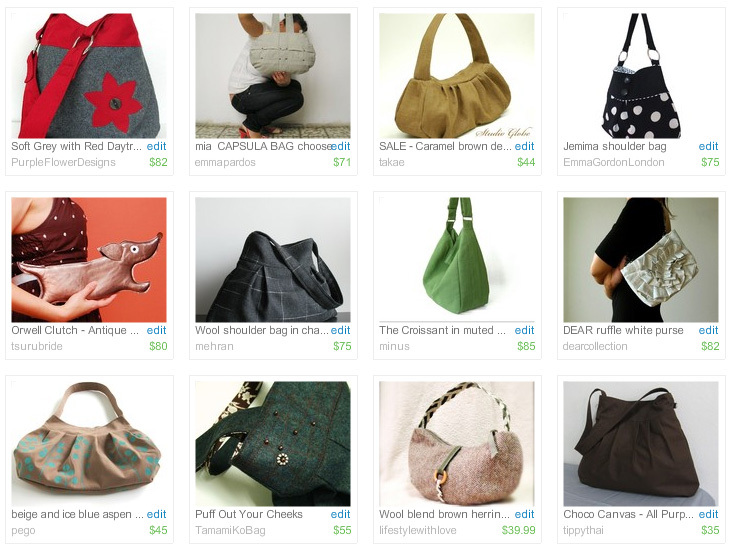 You will find info about new trends, designers, looks, and many more handmade related articles. Click on the link to read it full size. here you have a small preview of all the goodies you will see in it! I would love to read your feedback on it and what you would like to see in the next issue! Wohoo!! Almost Christmas and that is why I bring yo one of our most fashionable giveaways every! 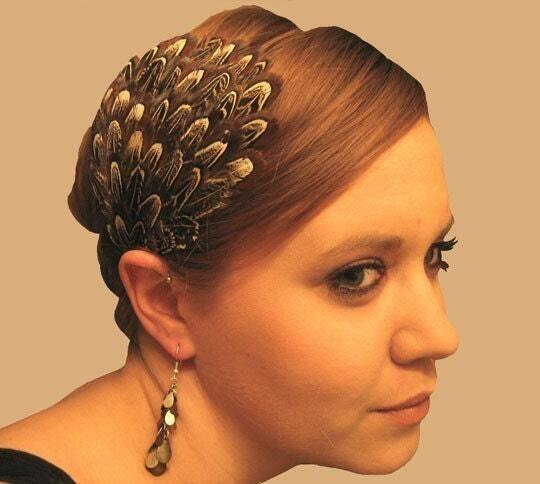 A feather headband! I love everything that has feathers, and I wish I could wear this any day... sadly I can' since I don't want everybody on the street to look at my head so I will have to wait until the wedding I am invited to in July. Darn! Visit christinececelia's shop and pick a favourite item. This giveaway ends 28th December at midnight EST. Good luck! I know this article is probably a bit late for most of you, but I haven't put the Christmas tree yet! LOL Me and my mother are doing it tomorrow evening ;) Yes, no Christmas cheer in our house yet.. every year happens the same, christmas doesn't arrive to this house until 20th December or so. by Jessica W. is a copywriter, an ice cream lover, and a nail-biter. My grandmother’s Christmas tree was a spectacle. Every year, Granddad chose the only Douglas fir on the tree farm lot that seemed to aspire to be in someone’s home. It must have spent years planning just how to splay its branches for optimal ornament dangle. Unencumbered by an imposing “theme,” the tree was a hodgepodge of decorations, crystals and lights. It was massive but humble, and it seemed proud to exist for the sole purpose of making people happy. Here are a few ways to create this kind of special Christmas tree. 1. Buy fresh, let it rest. The key to a long-lasting Christmas tree is cutting it down yourself. Let it rest on the porch, in water, for up to a week before you bring it inside. It will drop its first initial needles, but this kind of conditioning will adjust the tree to the indoor climate…at least according to Granddad. 2. Hunt for old ornaments. The most efficient way I’ve found is to limit yourself to estate sales. Nearly every grandmother has her own expansive array of decorations. You’re likely to gather enough for an entire tree just by scavenging one basement. Plus, you won’t have to pay antique store markup. 3. Blend old and new. My line of suncatchers called Ornamentary, My Dear (www.ornamentarymydear.etsy.com) does just that. These ornaments are new, but their antiqued silver lead-free solder and bubbly cathedral glass make them look like they’ve been passed down through generations. 4. Let there be light. Old strings of tree lights may have broken insulation, frayed wires, or any number of other problems. Avoid them. Instead, purchase brand new tree lights, but stick with white or pastel hues, not the brighter ones, and definitely NOT blinkers! 5. Round up icicles. You can use crystal icicles, but my grandmother’s plastic ones looked just as good. Or, if you ever come across vintage lamp crystals, purchase them for an elegant interpretation of an old standard. 6. Go for garland…maybe. That’s up to you. 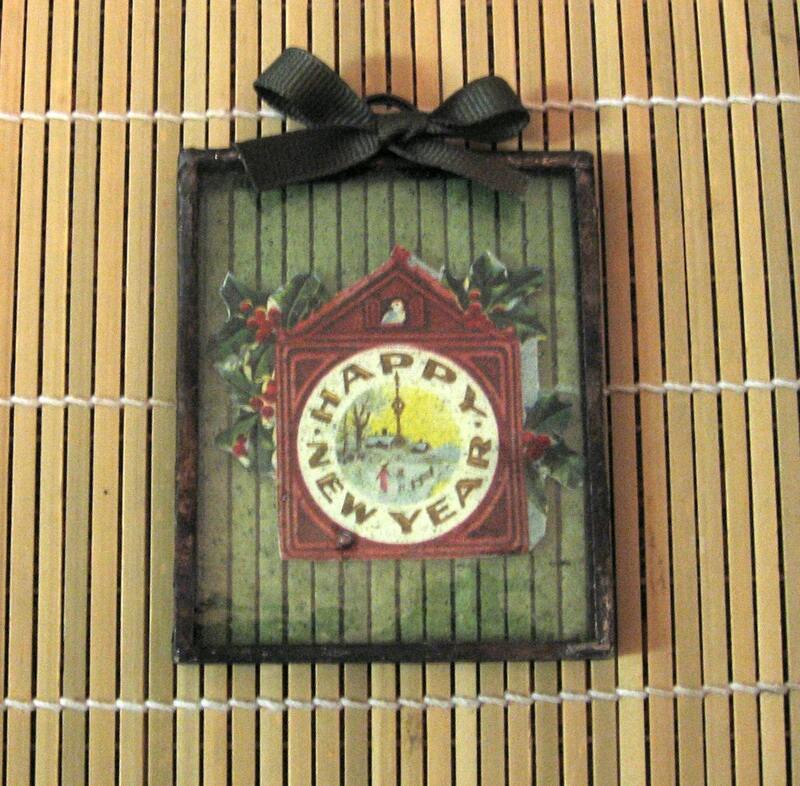 One word of caution—choose thinner garland; thick, bushy tinsel garland looks more 1982 than 1952. When you’ve gathered everything you need and the tree is ready to go, spend an afternoon bringing your elegant evergreen to life. Make some mulled cider, turn on the Victrola, and create a spectacle of your own. Copyright 2008 by Ornamentary, My Dear. I'm back to blogging! Sorry I have been missing these last days, between editing the online magazine and the job hunt I don't have much free time. It's so weird how fast time flies when I am not doing anything real (you know, being at home all day in the internet lol). Agua de Valencia! =) It is made with Cava (Spanish drink similar to champagne, usually cava is cheaper than champagne hehe - If you can't find Cava you can probably use cheap champagne or something similar) and very very easy to make. Hope you like it, believe me, it is yummy!! Read the recipe at Hand Made Europe Blog! Monday Giveaway - Lip Balm Holder! This is a fantastic idea! Perfect for the winter, to always have your lip balm on hand. And she has different models too so your bigger lip balms will fit too. 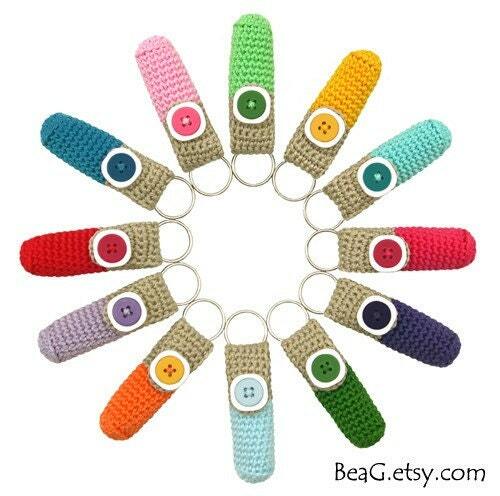 The winner will choose 1 keychain lip balm holder from BeaG's shop. Visit BeaG's shop and pick a favourite item. This giveaway ends 21st December at midnight EST. Good luck! Gift Guide - Bags Addiction! Gift Guide - For fashionable Women! Yesterday I hosted at the Etsy chats a fashion chat were we had quite a lot of fun! I showed some of my favourites in bags, clothes, accessories and jewelry. Now if only I had a fancy party to go to so I could buy one of those dresses... ahh! A beautiful and bright ring to go with your favorite sundress! 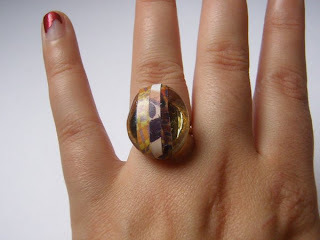 A yellow glass glob is collaged to create a truly ooak ring! Coated with gloss for protection. Mounted on a gold plated adjustable ring base. 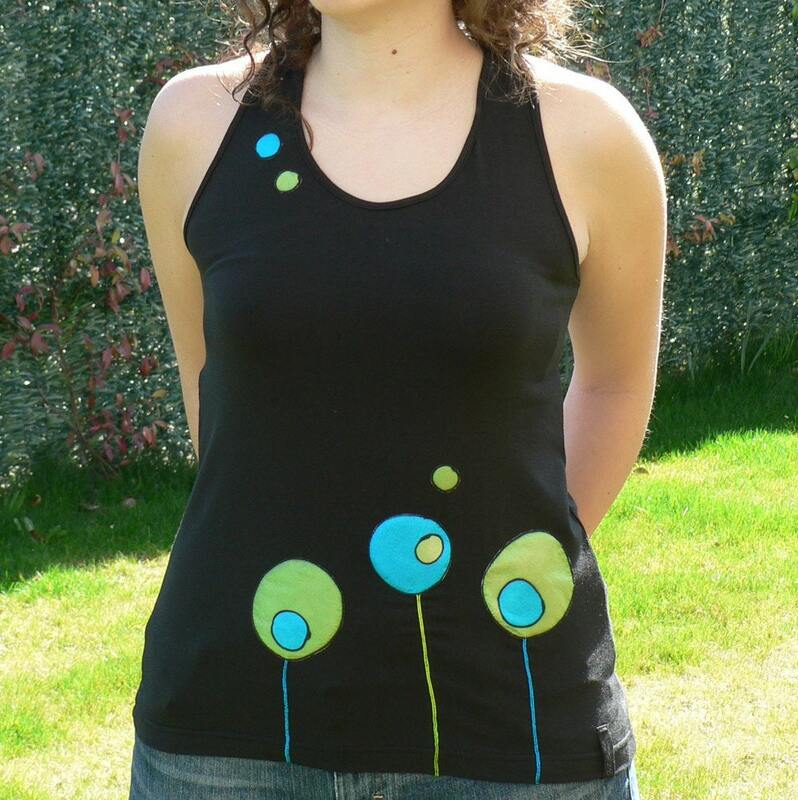 Own this beautiful piece of wearable art! Visit bakasartysta's shop and pick a favourite item. This giveaway ends 14th December at midnight EST. Good luck! Finally scheduled for Monday 8th December at 7 pm GMT (UK time). That is 8pm in central Europe, and 2 pm EST time. So I have too many hours to think about stuff now and I have too many crazy ideas (in the good sense). Aaaand... why would you care about this? Well, first of all I need collaborators to write for the online magazine. Interested people, please contact me. And second of all, I love the shopping event the Storque and Etsy are doing every night and since I think it is a great idea, I think we could do the same! Organize a fashion & handmade chat/shopping event. 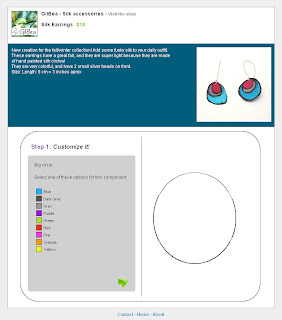 Hosted in the Etsy chats so we can showcase items. I love to find great and unique pieces, as well as fashion stuff and clothes, so if you need help with shopping for your mother/father/brother/husband/boyfriend/girlfriend/wife, etc, I think it could be a great opportunity! I will help you out pick some great items for this Christmas or for yourselves, and talk a little about fashion! So... who wants to come? I would like to host it on Sunday or Monday evening by 7 pm GMT (UK) time. Who is in? Please comment if you are coming or would rather host this on a different date (state if you rather have it on Sunday, Monday or another day). I wouldn't want to be there by my own! Once I know the date I will post it in the blog. So... just looked in my closet and I don't have any cool (or at all) sport clothes. See what I found in Etsy. Play with it all you want, it is only a test page. What do you think? As a buyer: would you like to use it? As a seller: would it be useful for your business? Oh, and also need a NAME for it! So far I named it customizer, but it doesn't sound cool enough :P - Help me! And finally, one more thing. I love to design catalogs, covers, etc, so I thought I could transform the monthly newsletter into an online magazine to combine both my passions: design and fashion. I'm not interesting enough to write more than 2 - 3 pages so... anyone wants to collaborate with an article related to handmade and if possible: fashion? Anything could fit in: kids, decoration, fahsion, beauty, .... Contact me if you want to help! Ooops forgot one thing! If you live outside Europe and would like to get one of my items for Christmas, tomorrow is the last day I can ship it and assure you it will arrive on time. Please make your Christmas shopping by 4th December. Sorry last week was a little slow! Hope you enjoyed the thanksgiving weekend and do some holidays shopping today :) (It's cyber monday!) oh, and, Hello December! They are super cute!!!!!! I love plushies, and these ones are fantastic! The winner will receive ONE plush bunnie made by yours truly..Paper Girl Productions...taking the world on one plushie at a time. 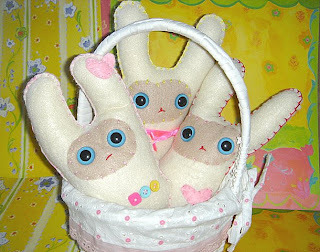 The plush bunnie stands approx 8in tall and is completely handmade one stitch at a time from my own original pattern. Comes from a smoke free home and pet free home for the bunnies are unfortunately allergic to other animals. Visit Paper Girl Productions's shop and pick a favourite item. This giveaway ends 7th December at midnight EST. Good luck! 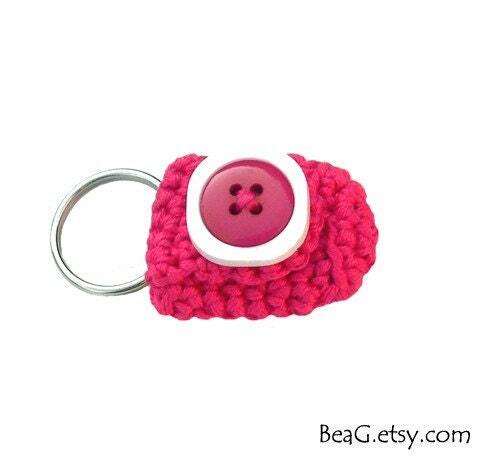 Also: We are extending the deadline for the giveaway: Key Fob by SewMuchDetail until 7th December too. It's a fantastic keychain, and you still have 1 week to participate! And finally: I am running a sale! I have marked down all my summer and winter silk shirts from $44 to $30, a %30 discount! Check them out here.